Half of all Americans over 30 years old have periodontal disease. At Mint Dental in Edgewater, New Jersey, Young Kim, DDS, treats patients of all ages for periodontal disease. Dr. Kim truly cares about your oral health and focuses on helping you prevent gum disease from progressing from gingivitis to the advanced stages of periodontitis. It’s important to seek treatment for periodontal disease as soon as you notice a problem since it can become a serious medical condition. For expert diagnosis and treatment, call to schedule an appointment or book online today. “Periodontal” means “around the tooth,” so periodontal disease is an inflammatory condition of your gums and the support tissue surrounding your teeth. Periodontal disease often begins as gingivitis, which is a bacterial infection in your gums. 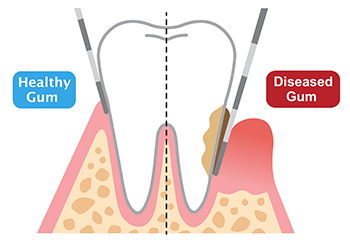 If left untreated, plaque and bacteria build up along your gum line and gingivitis progresses to periodontitis. Periodontitis, a more advanced form of gum disease, can lead to loose, decayed teeth, and eventually destroy oral connective tissue and your jawbone. Periodontal disease is the leading cause of tooth loss, but one that is highly preventable with good oral hygiene. If your gums bleed when you brush your teeth, or you find it painful to eat certain foods, it’s a good idea to schedule a dental checkup so Dr. Kim can evaluate your symptoms and determine the type of periodontal disease you have. She customizes a treatment plan based on your individual needs and helps restore your oral health long term. Your treatment for gum disease depends on the extent of your condition. Dr. Kim may recommend scaling and root cleaning to remove the plaque and bacteria from along your gum line. Additionally, she may place a microbial agent in the pockets of your gums to combat the infection and prevent further destruction of bone and soft tissue. She may also recommend a dental hygiene plan that includes a prescription mouthwash to help keep your mouth free from bacteria, in addition to brushing and flossing. If you have the signs and symptoms of gingivitis or more advanced forms of periodontal disease, don’t wait to seek professional treatment. The sooner you treat the infection, the better chances you have of preserving your teeth and gums and preventing the infection from becoming systemic. Call the office to schedule an exam or book online today.